Bruce Mast & Associates - Welcome! The focus for businesses must be on producing outcomes, not on completing tasks; on creating value, not on function areas; on thinking and acting as an integrated whole, not as a linear-sequential assembly line. 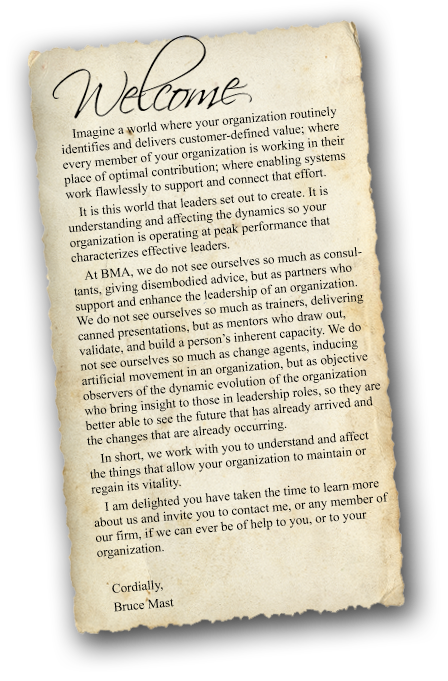 BMA takes a comprehensive approach in providing services. We work from the premise an individual will only be successful if the group is successful, and the group will only be successful if the individual is successful. Therefore, we deliver our services within the overall context of an organization's vision, culture and current marketplace challenges. Partners with Business NH Magazine and NH Businesses for Social Responsibility for 11 years in identifying the Best Companies To Work For In NH. © Copyright 2011 | Bruce Mast & Associates, Inc.